At the very beginning of the year, I saw an inspiring collection photographs from Cuba by by photography partners Alex Webb and Rebecca Norris Webb at New York’s Ricco Maresca gallery. You can view a selection of these photographs on David Alan Harvey’s Burn site here. And Alex and Rebecca talk about their collaboration on their Two Looks blog here. I am new to the images of Rebecca Norris Webb but I have long admired Alex Webb’s photographs for their ambiguity and sense of mystery. Webb’s attention to colour and composition is fundamental to his work. But for me, most impressive is his ability to capture those moments when elements outside his control converge and lend real resonance to a scene. In Two Looks, Alex and Rebecca identify this notion, describing it as serendipity or the lucky chance. 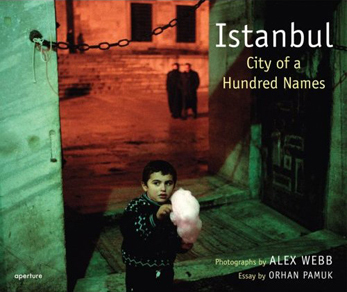 And it was a moment of visual insight that clearly struck Webb when two mysterious figures entered this scene in Istanbul which later became the cover for his book, “City of a Hundred Names”. What makes this kind of photography exciting for me is the notion that these moments happen all the time. As Elliot Erwitt, Webb’s colleague at Magnum Photos, says, “You can find pictures anywhere. It’s simply a matter of noticing things and organizing them.” Of course for the most part, these “pictures” pass the world by because no one was there to capture them. Fate has intervened and occasionally presented pictures to me. Significantly it has always been during those moments when I have been patient and willing to wait, to watch and to identify a moment. 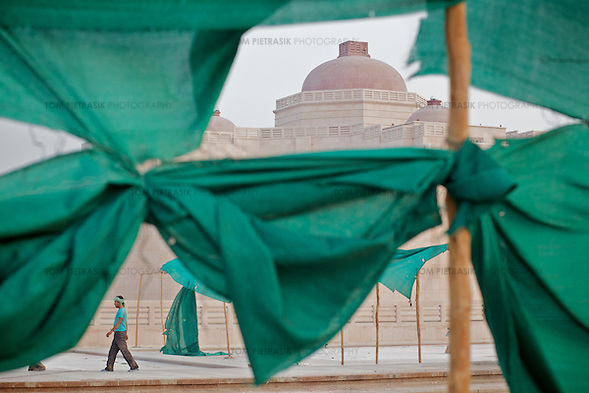 So it was that a man, wearing a green shirt wondered past this scene of a building site in Lucknow while I was working on a story about Chief Minister Mayawati and her Ambedkar Park for the Financial Times Magazine. Members of the low caste Saharia community challenge a Public Distribution System (PDS) employee about the failure to supply them with ration cards. Fate had a part to play when the elements of the picture above unfolded before me and it was only last week that I noticed the Varanasi tea-lady pictured at the top of this post adopting a posture that perfectly mirrored the statue of a deity standing above her. 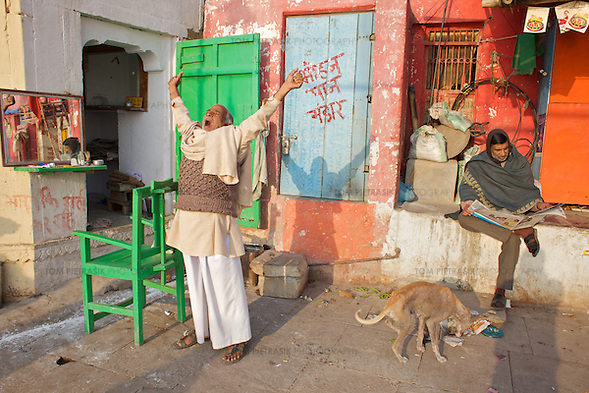 You can see more of my recent photographs of Varanasi, including the picture below, on my website here. Tom, this reminds me of something that I think about sometimes. Many shots we take outdoors are likely to have some random person in them, whether on purpose or serendipitously — like the ones in your post. I can’t help wondering if I figure in any number of such photos in albums around the world — perhaps somebody’s memories of their visit to the Taj, for example, have me pottering around somewhere in the background. Somewhere I have a picture I took of a few friends outside the Met in NYC. It was only several years later that I noticed that a random man in the frame was wearing a shirt identical to one I used to own at the time, and quite possibly the one I was wearing that day. It all makes you wonder if the chap in the shirt has a photograph of you taken on that same day outside the Met! With the ubiquity of digital cameras in phones, I am sure that this sort of thing will occur ever more frequently in the future. And perhaps, with the advent of face-recognition software, it won’t be long before we’re able to find ourselves self hidden in someone else’s online photo archive.